Originally from the country town of Port Macquarie, Australia, he now currently lives in London working as a cartoonist whilst not in his daytime job as a TV Cameraman. He tries to draw on his interests in bad horror and kung fu movies, travel, animals and tattoos in his work as much as possible. 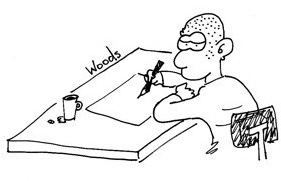 More work and info can be found at http://woodsycartoons.blogspot.com. View the strip "Insert Brain Here"